Bless Our Hearts: Birthday Week Commences! Lily, Owen, August, and Vergil all have birthdays this week. Not to mention Billy and Shayla. And another one of my oldest friends. I feel like I'm forgetting someone. Anyway, as you can only imagine, it's going to be a hectic week filled with cake and parties and suppers out and lots of doin's. 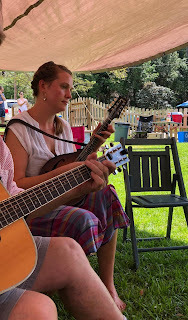 Today started the whole celebratory event with Jessie and Vergil throwing what they called a "Toast and Jam" and inviting neighbors and friends to come over for brunch and mimosas and some music-playing. Although my presence was in no way required, I really wanted to go. I figured at the very least I could take August his dress and maybe help out with the children a little and I texted Lily and asked if she was going. She said she wasn't and I asked if maybe the boys would like to go with me and she said that Owen had just told her that he wanted to do something with me so that worked out well. 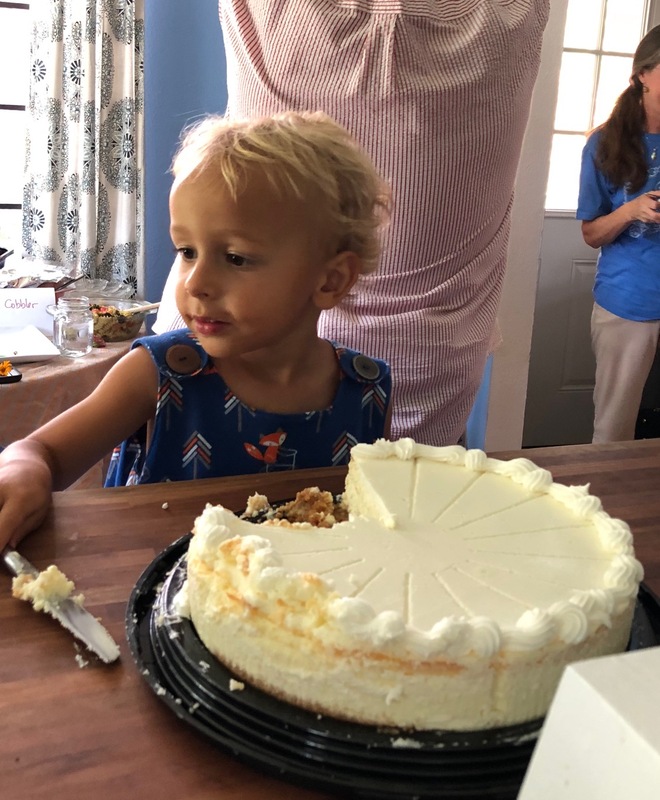 I made some deviled eggs and went and collected Owen and Gibson and we drove to town, stopping at Costco to get a giant cheesecake because Jessie's been wanting a cheesecake and some flowers for the party and some turkey roll-ups to add to the brunch because they are Owen's favorite. When we got there, Vergil was in the kiddy pool with Levon in his lap and his harmonica in his mouth, playing along with a lovely group of musicians playing everything from the dulcimer to stand-up bass. I recognized some of the people, of course. Jessie's old music teacher from high school, for one. He's a glorious man and the school band was a bluegrass band and that is where Jessie started learning to play the mandolin. So I would love that guy even if I didn't love him for being who he is which is an amazingly sweet man with a glorious mane of white hair. I actually met him back in the seventies, I think, when he and his then-wife were planning a home birth. August met us in the driveway, fresh out of the pool and carried the flowers to his mama. They came in the house as I was putting my food out and I showed him his dress. Jessie asked him if he wanted to put it on and he said he did. I pulled it on over his head and he sort of wiggled around a bit, testing out how that garment worked and then he looked like this. Owen and Gibson felt a little shy at first but then they began to interact with the other kids and I was so glad they'd come with me. 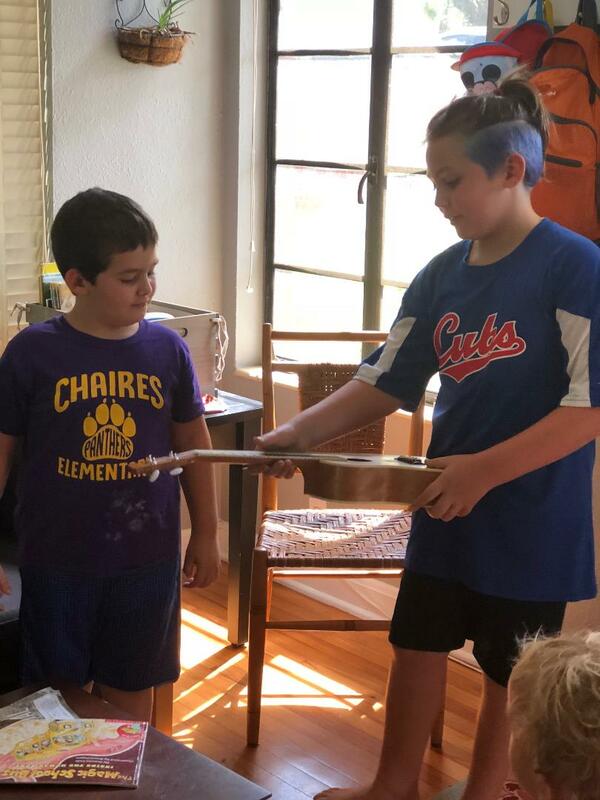 Lily has re-dyed Owen's hair for him and this is the only picture I got that really shows it. He's such a rock'n'roll kid. For his birthday he's getting both ears pierced. He wants hoops. I have to admit that I don't know whether to hope that I've influenced him or deny the fact that I have. Poor child. There may have been a bit of Keith Richards lore in his young childhood. And Rolling Stones music. And he may have heard me say once or twice that I do love a man with hoops in his ears. Well. It is what it is. And here's Gibson, trying to play a ukulele. That kid. I just adore him. Several times during the day I reached out to hug him and he'd say, "I love you, Mer." I love him too. There were some other really cool kids there including a little girl named Ruby June which is about the epitome of great names in my opinion. She carried a little violin and bow around the whole time and she could actually pull some tunes out of it. Before the party was over, everyone had gathered around her for a take on "This Little Light of Mine" and she rocked it! Of course August wanted me to read books and so we did. At one point I had a small audience of sweet kids listening to me and nothing could make me happier. I held Levon for awhile so his mama could play music and that was wonderful. I actually chatted with mamas and neighbors and neighbor-mamas and there was another Mary there, around the same age as me. "I'm Mary," she said. 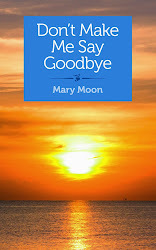 "No, I'm Mary," I told her. The bass player told me a story about a friend of hers who talks about his days of hanging out with the Grateful Dead and the Maharishi, who now lives in a retirement home. All I could think of was, "Well, that'll be me soon." Except of course I never hung out with the Grateful Dead or the Maharishi. I told her that Jimmy Buffet was building a retirement community and of course it's called Margaritaville. "A lot of people are making fun of it," I said. "But I can think of a lot worse places to end up." Jimmy's smart as hell. There aren't nearly as many baby boomers who are apt to retire in Presbyterian retirement villages as in generations past. I remember when it was a huge big deal in my mother's assisted living place when they put in a little pub where residents could get a beer. I imagine that in Margaritaville getting a beer with a shot of El Patron won't be a problem. I also predict that at least one of the doctors who takes care of the residents will be able to prescribe medical marijuana for the aches and pains and inevitable maladies of older age. Hell, I should sign up now. Anyway, back to the party. 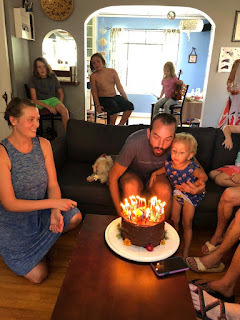 There was a cake! A chocolate stout cake which was a thing of beauty. Vergil has asked for one every year after the first year that Jessie made it. He and August blew out the candles together. August was so happy to get cake. He took his bowl of cake and ice cream back to his bedroom to eat in peace. I thought that was very smart. That boy does love his sweets. Here's another picture of Owen, this time holding Levon. He's so good with little kids. I wonder why. 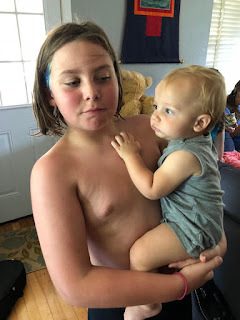 I'd forgotten to tell him and his brother that they should bring their swimming trunks to play in the little pool but I told them to just go ahead and get in with their shorts on. Which they did. At one point today Owen said, "I want to do this again!" And I will admit to you that before I went to the party, while I was making the deviled eggs, I was so very anxious but I am so very glad I went. I talked to grown-ups. I talked to kids. 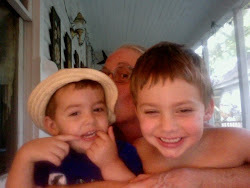 I got to hang out with grandchildren. And now Mr. Moon is home and I'm going to cook some red snapper. I am wondering if Miss Darla is broody. She's been doing this for the past few days. The way she's spread out, she looks serious. 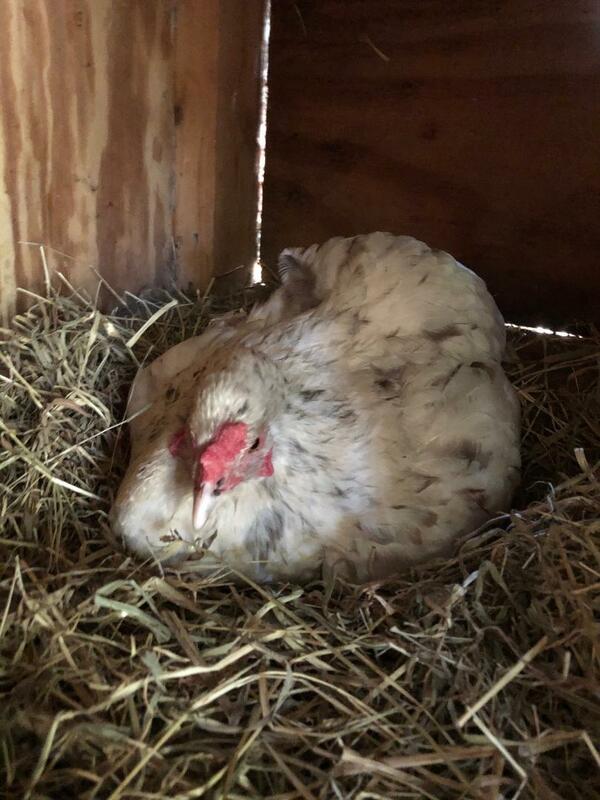 Of course, she's only got maybe one egg underneath her. Do I want to go through this again? Have Liberace and Ringo been doing their husbandly duties which would ensure that sitting on eggs might actually result in babies? Seriously! Small celebrations and then a final mega-celebration on Sunday. I'm going to need a vacation by next week. It sounds like such a great day. I am glad you had it. August is rocking that dress! He IS rocking the dress! I think he's adorable in it. Your day sounds GLORIOUS!! 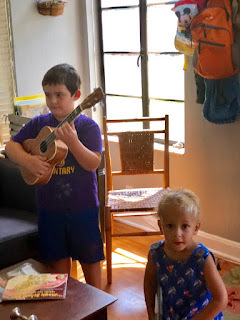 Babies and kids and ukuleles and cake!!! Glorious I say! Your day sounds fantastic. And Owen and Jonah are parallel spirits--he's been hinting for an earring and dyed his hair blue last summer. I love our pirate boys! August looks delighted with his dress! What a glorious day. I think he did really like it. What I loved is how two minutes after he had it on he completely forget he was wearing it although I did see him do a little experimental twirling now and then. For some reason this post has made me miss the south and my old life there -- especially in Tennessee when I was married to a musician and we did these things. 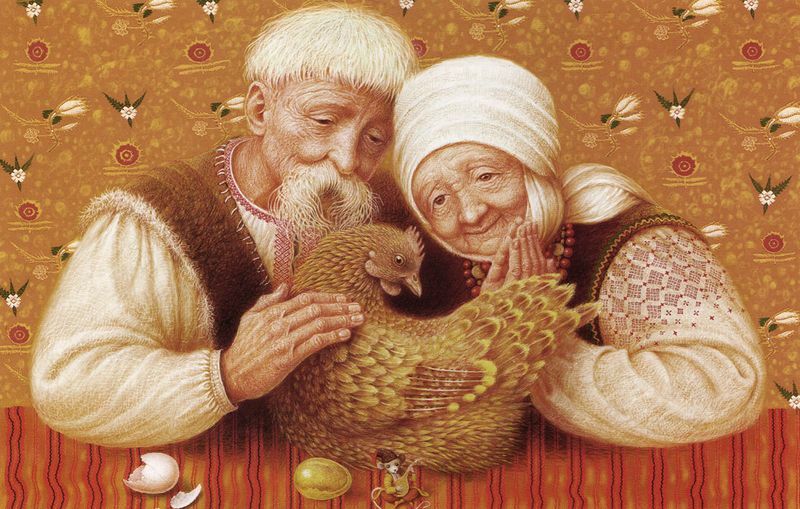 Thank you for the brilliant description of the festivities and the glory of your grandchildren. And happy birthday week to all! 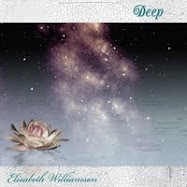 Oh, Elizabeth. I bet you DO miss those days. It's pretty special when you get to hang out with musicians birthing and enjoying their music, isn't it? And it's also extremely rewarding to feed them. What a rollicking good time, and of course Owen is a rock and roll kid! He loves his Mer and his Mer loves Keith, and him of course. August looks so happy and comfortable in that dress! So many birthdays this week! You'll be whirling and twirling. Please share pictures! Spinning like a dervish, I think. Lord, give me strength! what a fun day and what a wonderful loving family. Owen with his blue hair and getting both ears pierced, August in his dress, Gibson loving everyone. When I was talking to the bass player she said that I sure did have a great family and I said that yes, I did, and she asked if I had other kids and grandkids and I said that yes, I did! When she found out that they all lived here she was amazed. And then we traded stories about trying to get as far away from "home" as possible. Haha! Re. 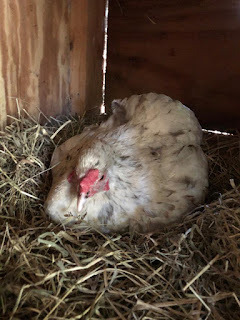 Darla -- isn't she the one who lays the big eggs? Maybe that's why she's spread out, and maybe she'll have a big chick! Looks like a terrific party. 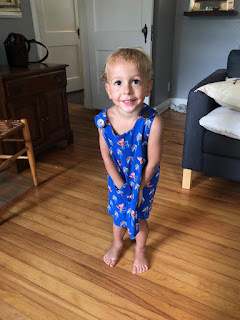 August looks so happy with his dress! And Owen's hair is great. Can't wait to see the earrings! Darla is the one who lays the big eggs! Good memory, Steve! One big chick. That would be hysterical. They spread out that way to make sure that the whole area is covered, I guess. They control the temperature that way. I feel sorry for her. It's got to be wicked hot in that hen house. I sort of want to make August another dress. We'll see how this one goes. There will be pictures of earrings! Happy Birthday to Virgil and August! I love Owen’s style. Does his school allow the hair color and hoops? They have so many rules now, I just don’t know! I am so impressed with your sewing. Why not see dresses for yourself too?? Well, I know they allow the hair. Not sure about the hoops. We're about to find out, I guess. I used to sew dresses for myself. I actually have a pattern now but I haven't found any fabric I really like. The little fox frock did turn out so well! He is delighted, I can see that!I reckon that if a kid is a rocker at such a young age, that kid will be honest and forthright and carry themselves well though this life. It's the Keith no BS influence. YOU are the Mary! There is none other. I would not have arm-wrestled the other Mary for the title of the Real Mary. She looked pretty scrappy. Owen better be honest and forthright or he'll have his Mer to contend with. I should make him a bracelet that says, "WWKD?" "I made some deviled eggs and went". Golly. I've made so many deviled eggs in my life that I could do it in my sleep. I swear. But thank you, dear Sabine! Honestly, I can't imagine a party I'd like to be at more. The cakes alone! But the company and music and happy kiddies too, all perfect. I'm thrilled to hear about Margaritaville, I can't wait to tell my father about it.